Factcheck: Has the cap on infant class sizes been scrapped? The Tories have scrapped Labour's policy to cap class sizes at 30 pupils. The cap hasn't been scrapped, but there has been a three-fold increase in oversized classes under the Coalition. Ed Miliband announced that Labour will cap infant class sizes at no more than 30 pupils, in a speech today setting out the party's vision for education for the next government. "The proportion of class sizes bigger than this has trebled. That means the number of youngest children taught in such classes has risen by over 60,000." Infant class sizes are still limited to 30 pupils in England, so the cap hasn't been scrapped. But exceptions to this rule are made such as for children moving into an area outside of the normal admissions round, and for children who have special educational needs placed in a mainstream school. The circumstances in which pupils are made exceptions, and how long they're an exception for, has changed under the Coalition. But the changes have only just come into force so we can't see much of their effect in these statistics. 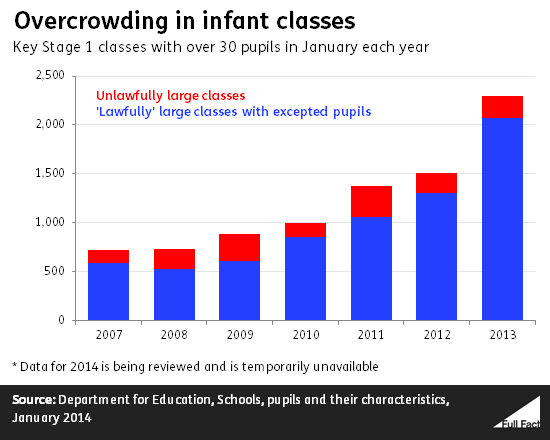 What we do know is that more pupils are considered exempt—over 90% of the increase in overcrowded infant classes between 2010 and 2013 were because of excepted pupils so these classes were 'lawfully' overcrowded. In 2013, pupils getting a place through an appeal and on the basis of being a new resident in the area were by far the biggest reason given for classes being overcrowded—making up three-quarters of the reasons given. So these are children being lawfully excepted on the basis of exceptions originally defined by the last Labour government. Both sides are agreed that more school places are needed to take the pressure off class sizes and the debate is ongoing about the best way to do this. There's been a three-fold increase in Key Stage 1 classes (ages 5 to 7) in England with more than the government's limit of 30 pupils, from 995 in January 2010 to 2,985 in January 2014, according to the most recent figures from the Department for Education. Most of this increase up to 2013 has been among classes deemed 'lawfully' large—where the extra pupils are 'excepted' ones. "The recent and projected population increases are likely to increase demand for teachers and the number of class rooms, making it more challenging for local authorities to keep Key Stage 1 classes within the legal limit of 30 pupils per class." The data for 2014 is being reviewed so we don't know what's happened since 2013 and if the new exceptions introduced by the Coalition in 2012 have seen any increase in frequency. The Coalition have replaced regulations introduced by the previous Labour government to keep a limit on class sizes in England, but the updated regulations still maintain the limit—what they have changed is the situations in which pupils become an exception to this rule and how long they remain an exception for. The initial limit, which took effect from the 2001-2002 school year, allowed exceptions in circumstances such as when a child couldn't gain a place at any other suitable local school because they moved into the area outside of the normal October/November to January admission round. But the regulations also set out that these pupils admitted outside the admissions round would only be classed as excepted for their first academic year at the school. Other excepted pupils—like those who were registered at a special school but who were taught in part at a mainstream school—would retain their excepted status while they were at the mainstream school. The Coalition replaced these rules with a new set of regulations, which added further circumstances in which a pupil could be excepted. This included where children were previously looked after by the local authority, children with a twin already at the school and children of armed services personnel admitted outside a normal admissions round. Excepted status can now only be removed if the pupil could be taught at the school in an infant class smaller than the limit—so they no longer lose it after their first academic year at the school. Labour say they would prevent infant classes from being overcrowded (more than 30 pupils) for longer than 12 months, which if enforced without any exceptions would be a significant change. Piece updated to make clear that the regulations refer to England only.